Scientists aren’t quite sure how the placebo effect works. This phenomenon occurs when a patient believes they are getting treatment and their condition begins to improve, despite not actually receiving medication with an active ingredient. A new study has also found that some breast cancer survivors who regularly practice stress reduction techniques, including mindful meditation and yoga, can physically change their cells, despite no longer receiving treatment. Linda Carlson of the Tom Baker Cancer Centre in Alberta, Canada is lead author on the paper, which was published in the journal Cancer. Their study participants had an average age of 55 and had survived breast cancer at least two years prior, but were still feeling considerable emotional distress. There were 88 participants in all that had been randomly separated into three groups, with blood samples taken before the start of the 12 week study. The first group went to weekly 90-minute meetings where they were directed in non-judgmental awareness of the present moment and guided through Hatha yoga, which they also practiced at home each day for 45 minutes. The second group met for 90 minutes each week to discuss their feelings, both positive and negative. The control group only participated in one 6-hour-long workshop about stress reduction techniques. When blood samples were taken at the end of the study, there were some interesting differences between the groups. 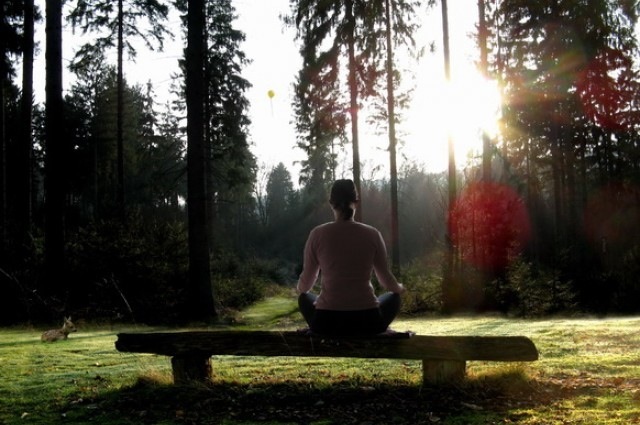 “We already know that psychosocial interventions like mindfulness meditation will help you feel better mentally, but now for the first time, we have evidence that they can also influence key aspects of your biology,” Carlson said in a press release. Telomeres are protective lengths of protein that exist at the ends of chromosomes. These get shorter after replication and determine how quickly the cell ages. When the telomeres are gone, the chromosome begins to degrade, which is bad for the health of the cell. After the study period had ended, the two groups that had practiced mindfulness and went to weekly meetings had preserved their telomere length from the start of the study, while the control group that did not learn mindfulness had shorter telomeres. This study appears to suggest that our minds and bodies can affect one another, but it isn’t clear how that actually happens or what factors are actually at work here. The two groups that experienced telomere length preservation both took time to acknowledge stressors in their life, though they went about it in different ways. As the group that mediated also practiced yoga, the physical exercise could have confounded these results and will need to be clarified in further study. The next step in the research will be to see if these results can hold up using a larger study group over longer periods of time, or if preservation of telomeres through stress reduction is only short term. Additionally, it has not been made clear if these differences in telomere length actually have an effect on the individual’s overall health. ← Previous Previous post: Should Children be Given Anti-Depressants?